I really love my city – she is beautiful and steeped in history. I have lived all over South Africa and there is nowhere that has a CBD that I can honestly say I like. And me likey the City bowl. Probably what I love the most is that no matter what type of person you are: corporate climber or electric spinach afficionado, emo kid or earth child, there is a spot – a restaurant, coffee shop and club – for you in this city that will make you feel at home. 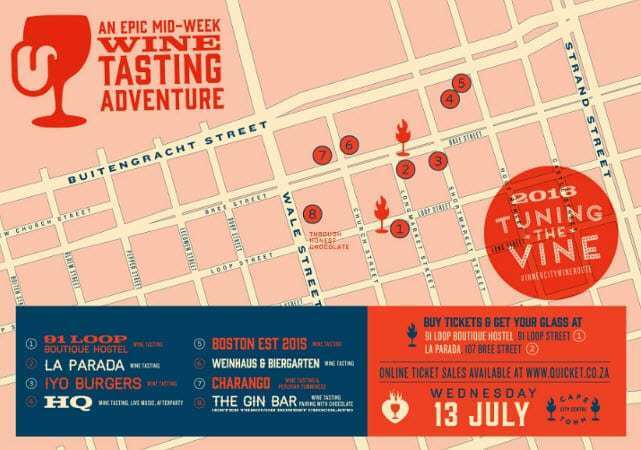 And definitely my favourite way to spend time in the Mother City’s CBD is at Tuning the Vine. The event is really well organised. Tickets are available from Quicket at R155 each (or R170 at the ticket station on the route on the day). Start at the ticket station (indicated on the map by flaming glasses). They will swap your ticket for a glass, wrist band and map. Then you and your posse make your way through the venues, tasting wines and buying delicious crafted nibbles. You don’t have to go in order and can definitely revisit venues. And it’s not just wines, I’ve tasted ciders and rum along the way too. I love this leisurely stroll through the city, stopping here and there to taste a delicious beverage or delectable morsel, maybe see some art and catch up with a friend I haven’t seen in ages and bumped into somewhere on Bree. 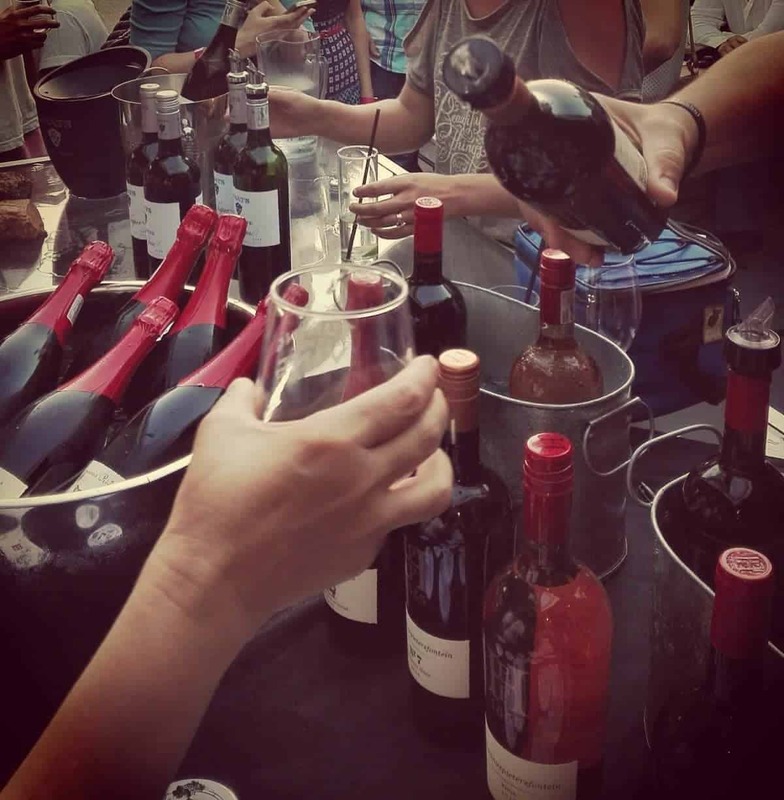 It is also a great way to show visiting friend what CT has to offer and taste wines that you might otherwise never have come across. The architecture, music, entertainers and laughing crowds set a perfect ambience for a winner evening. I always start early at 5:30 mostly so that we aren’t rushed and can just float along the route, backtracking if need be. But also mild paranoia that the wine will run out… My advice though is not to get overzealous – there really are a lot of providers so pace yourself. And perhaps get an Uber… Lastly, if you’re like me and never quite lost your student/early career mentality, have no fear, the cost of the ticket is offset by the incredible variety and quality of the wines on offer. It’s not too late to get your ticket for 13 July but it will also be happening on 10 August, 7 September, 12 October, 9 November and 7 December 2016. Just keep in mind that the Winter route (just July and August now) is shorter with 91 Loop, IYO Burgers, Boston Est. 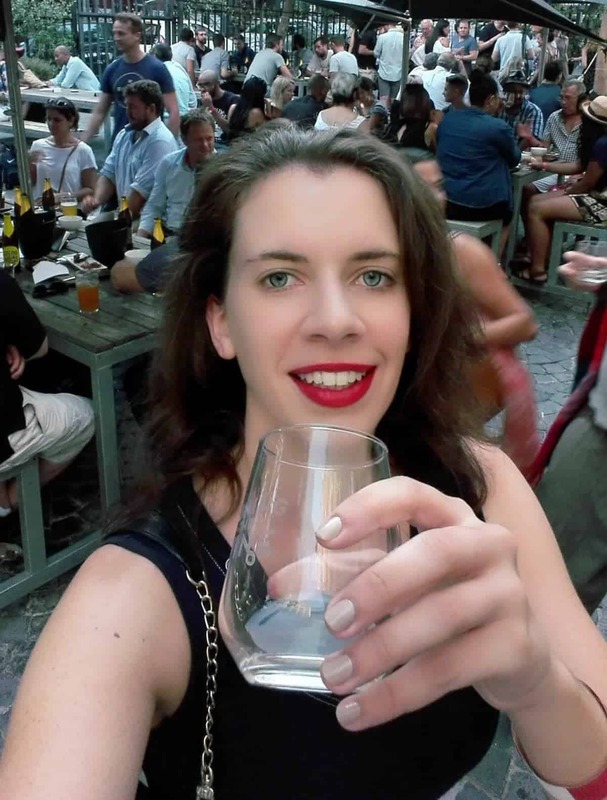 2015, Weinhaus & Biergarten, HQ, Charango, The Gin Bar and La Parada as the hosts.